Retinopathy can lead to blindness but the good news is that it can be treated, especially if retinopathy progression is caught at an early stage. It is likely that if you have had diabetes for a number of years, you may be at an early stage of having retinopathy. 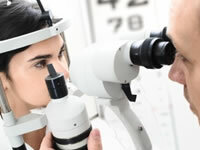 It is therefore important to attend a retinopathy screening appointment each year. Background retinopathy, also known as non-proliferative retinopathy, is when there are signs of retinopathy but not significant enough to need treatment to the eyes. In background retinopathy, some of the blood vessels in the retina may become blocked, swollen or have leaked but in most cases this won’t disrupt vision and won’t present symptoms. Note that a rapid improvement in blood glucose levels, a decrease in HbA1c of 30 mmol/mol (3%), may result in a worsening of retinopathy. Adopting a healthy diet and taking regular physical activity is important in achieving these goals. If you struggle to meet the health targets, your health team may prescribe stronger medication or suggest a different insulin regimen. Maculopathy occurs if retinopathy causes damage to the blood vessels around the macula, the part of the eye responsible for our central vision and ability to see detail. Such damage includes oedema, when fluid builds up in blood vessels causing them to swell and can result in protein leaking onto the macula. The first line of treatment for maculopathy is laser photocoagulation treatment which is used to seal the blood vessels that are leaking. If laser treatment is not effective, or maculopathy is more advanced, a drug called Anti-VEGF can be given as an injection. Proliferative retinopathy is a form of developed retinopathy whereby blood vessel damage has spread to cover a substantial area of the retina. As blood vessels become blocked and leak, new blood vessels may develop which are more prone to damage and leaking. Laser treatment can be carried out to allow oxygen and nutrients to reach the retina. In an advanced state of proliferative retinopathy, vitrectomy surgery may be required. Laser photocoagulation treatment can be used to seal leaking blood vessels, which is particularly important in maculopathy. In proliferative retinopathy, lasers are fired at problem areas, improving blood circulation and allowing oxygen and nutrients to get to the retina. This helps to prevent the new weaker blood vessels from forming and therefore prevents these weaker blood vessels from leaking. A local anaesthetic will be put on the eye, eye drops will dilate your pupils and a contact lens will be applied to keep your eye lids open and focus the laser beams. You should keep your eyes still to allow the treatment to be as effective as possible. Following the treatment, you eyes will be very sensitive to light and your vision may become temporarily blurred. Laser treatment is usually effective but, as with most surgery, success is not guaranteed. Multiple sessions of laser treatment can result in reduced peripheral visual and may affect your ability to drive. An Anti-VEGF injection is an intra-ocular injection in which a drug is injected into the eye to reduce leakage of fluid onto the macula and helps stimulate new blood vessels to improve the oxygen and nutrient supply to the retina. Lucentis and Avastin are two drugs which may be used, however, only Lucentis has been licensed for use in people with maculopathy. Avastin is a similar drug but was developed for use as a treatment for people with colorectal cancer and has not been tested or licensed for use in people with maculopathy. With that said, the drug is cheaper than Lucentis and the drug has previously been used off-license. Anti-VEGF injection can result in temporary increased pressure in the eye and blurred vision. People will usually receive multiple sessions at one month intervals. Vitrectomy surgery involves removing and replacing vitreous humour, the jelly-like filling of the eye. The vitreous humour is replaced by a clear substance, either gas or a liquid such as saline or silicone fluid. Vitrectomy surgery may be needed if a haemorrhage has not healed and is obscuring vision or the retina is in danger of detaching or has detached. Small clamps will be used to help to hold the retina in place. In time, the liquid or gas used to replace the vitreous gel will get absorbed by the body and your body will naturally create new vitreous gel in its place.